It is so well camouflaged. Wow, the bird (chickadee, I think?) is so perfectly posed and framed. It is set exactly against the hole in the bird feeder and looking straight at us. Nicely done! LOL "Are you lookin' at me?" Great shot, he looks so surprised to be having his picture taken. It has been so mild here, in the Southern UK, that our garden feeders are rarely visited, as there is so much natural food still available, which the birds are taking full advantage of. Ha! He's giving you 'the look'. 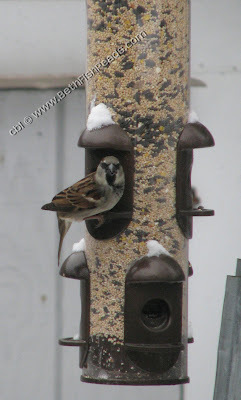 Oh, sweet little male House Sparrow! He is posing! And maybe giving you a wink and a nod for the food on a cold winter day. Quick pose before he digs right in? I'm with Sandy, he was posing for you. What are you lookin at? :) Nice shot. he is not posing...he is thanking the person who filled that feeder with all that food! Nice capture. He does look like he is posing. We just put up a bird feeder on Sunday, and the squirrels chewed through the plastic on the bottom so that all the seed fell out!! I guess that's what we get for going with plastic bird feeders! That little guy looks so adorable, just sitting pretty and munching! Great photo! It does look like he is a little peeved and looking directly at you! Back off!! This is mine!! "Step away from the feeder and no one gets pecked"
Great shot - love the way he's looking right at the camera! He's probably thinking he just struck gold....that's quite the bird feeder! Nice shot! I bet that House Sparrow is really enjoying that millet. I love the way he's looking at you.